Proposed Park Slope Historic District Extension II. Image Credit: LPC. Like the existing district, proposed extension would largely be characterized by 19th-century rowhouses, ecclesiastical structures, and 20th-century apartment buildings. On October 29, 2013, the Landmarks Preservation Commission held a hearing on the potential designation of the Park Slope Historic District Extension II. 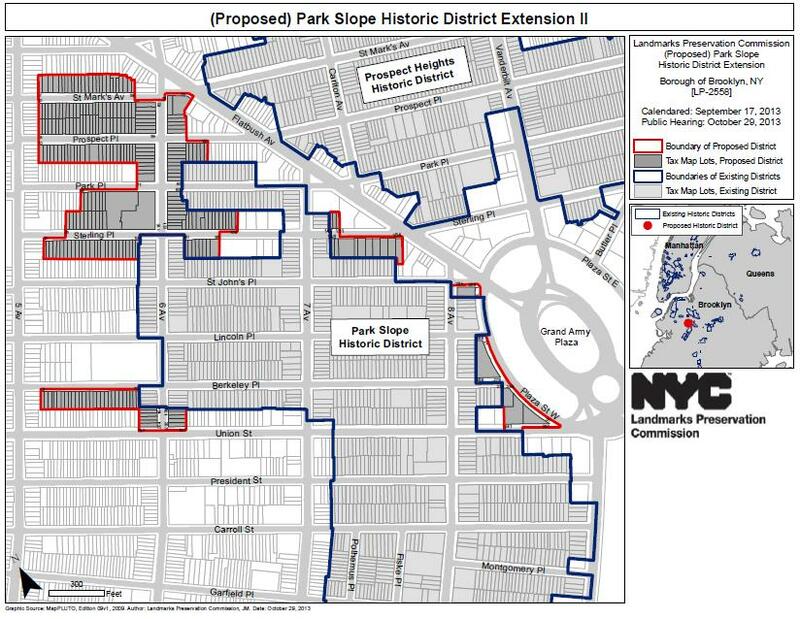 The proposed extension would lie to the north and west of the existing Park Slope Historic District, designated in 1973. A majority of the 287 properties to be incorporated into the extension are residential rowhouses from the mid-to-late 19th century. Wide scale development of the area that began in the 1860s were of the Neo-Grec and Italianate architectural styles, while development from the 1880s saw increased Queen Anne, Romanesque Revival and Renaissance Revival architectural styles. The district also includes some apartment buildings dating to the early 20th century, as well as St. Augustine Roman Catholic Church and Seventh Day Adventist and Christian Scientist houses of worship. Local Council Member Stephen Levin testified in enthusiastic support of designation of the extension, noting the area’s “block after block of beautiful residential buildings on welcoming tree-lined streets.” Richard Bearak, Director of Land Use for Brooklyn Borough President Marty Markowitz, testified that the area’s “beautifully crafted buildings” and “rich cultural heritage” needed protection from an “opportunistic real estate market.” Representatives of local Assembly Member Joan Millman and local Council Member Brad Lander also urged Landmarks to move swiftly to designate the district. Members of the Park Slope Civic Council spoke in favor of designation, emphasizing the threat of inappropriate development to the area’s character, the integrity of the architecture in the proposed extension, and the wide support for designation in the community. Several area residents spoke in favor of landmarking, with many testifying that the area was under significant development pressure. Area residents testified that an increasing amount of historic buildings were being demolished and replaced with out-of-character developments. Resident Elizabeth Finkelstein testified that there was no clear boundary between the landmarked district and the streets to the north. The Historic Districts Council and New York Landmarks Conservancy also supported the designation. Paimaan Lodhi of the Real Estate Board of New York testified in general support of designation, but recommended that several buildings that differed in typology, era, or quality of the representative architecture of the existing district be excluded from the extension. He further testified, “We strongly oppose the use of landmarking to prevent new buildings or limit affordable housing choices.” Resident Robert Minsky spoke in opposition to the designation, stating that including post-war multi-family apartment buildings in the historic district would mean “a total redefinition of the district.” Minsky also questioned certain factual assertions of Landmarks’ research department. Chair Robert B. Tierney closed the hearing after thanking those who testified and attended. No date has been established for a vote on designation. LPC: Park Slope Historic District Extension II, Brooklyn (LP-2558) (Oct. 29, 2013).